In popular folk lore this species, also known as the Stephens Island wren, is a conservation icon. It is sometimes said to have been both discovered and exterminated by a lighthouse keeper’s cat. 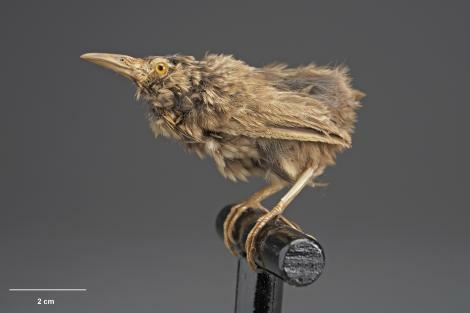 This bird may have been seen by workers constructing the first lighthouse on Stephens Island (outer Marlborough Sounds) in 1892, but it was unequivocally made known by that cat when the keepers settled there in 1894. The disappearance of the Lyall’s wren was very quick as the island became over run with feral cats which probably did originate from the lighthouse settlement, the last one known was brought in by David Lyall's cat in February 1895 as the cats started making noticeable inroads into the remarkable bird fauna that had survived on Stephens Island in the absence of any exotic predators. 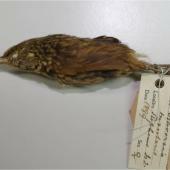 More interesting is the fact that Lyall’s wren could not fly. There was no keel on the breast bone to anchor the flight muscles, the wings were very short and rounded and the feathers were loose, so the flight feathers were not airtight. 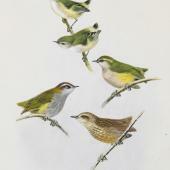 Just five species of song birds out of about 4000 species were flightless. 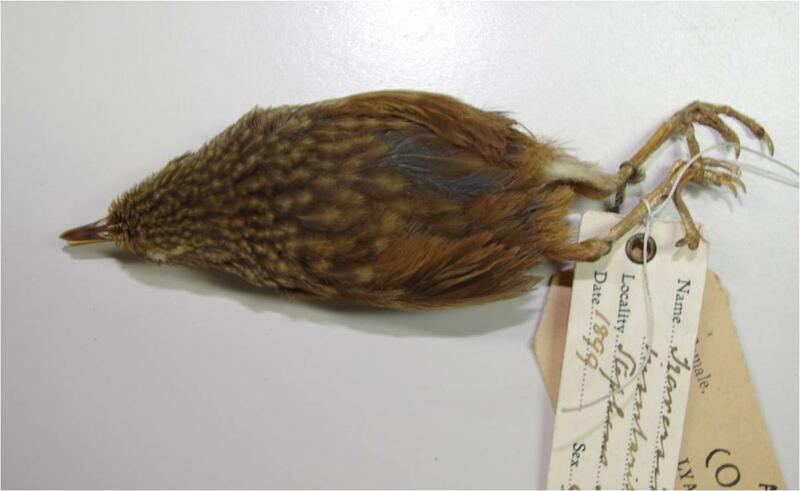 All but one of them were species of New Zealand wrens (Family Acanthisittidae) and this is the only one that survived until European contact. 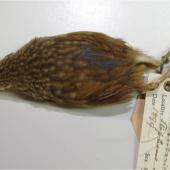 Lyall’s wren was a small drab bird with a solid bill and legs and big feet. The upper surface was plain dark olive with a darker brown edge to each feather, and a narrow yellowish stripe through the eye. The flight feathers and tail were dark brown. The throat and breast were brownish-yellow in the male and buffy grey in the female, with fine brown margins to the feathers. The sides of the body and abdomen were pale olive brown. The fossil remains of Lyall’s wren have since been found widely spread in the North and South Islands, especially in laughing owl middens. A living population survived on Stephen’s Island in Cook Strait until 1895. 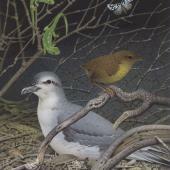 Living birds were seen but twice, in rocky areas within dense forest. 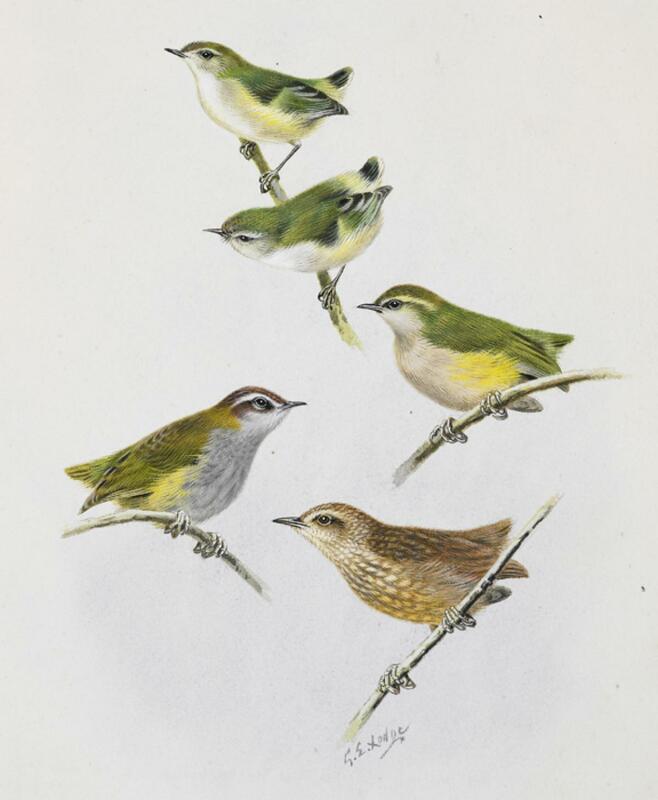 Lyall’s wrens were exterminated quickly by cats on Stephens Island but kiore had probably exterminated the vast populations on the two main islands before Europeans arrived. Galbraith, R.; Brown, D. 2004. 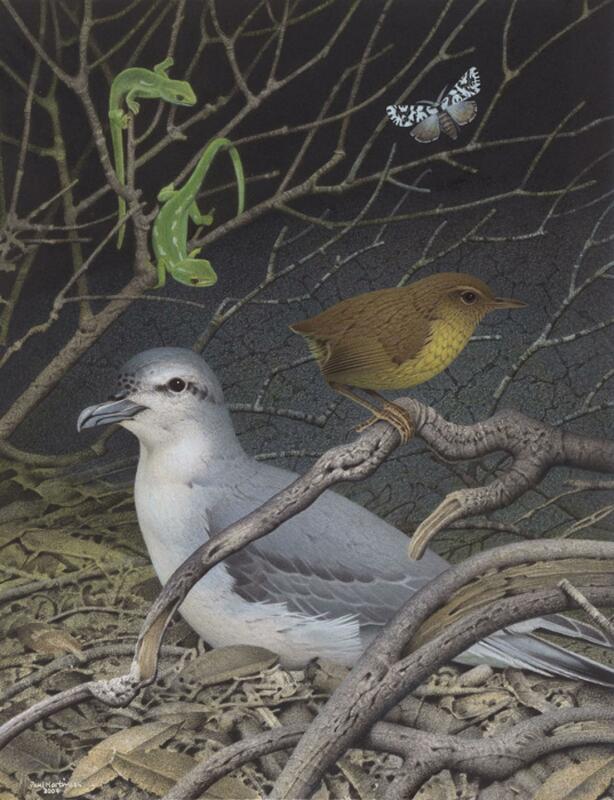 The tale of the lighthouse-keeper’s cat: discovery and extinction of the Stephens Island wren (Traversia lyalli). Notornis 51: 193-200. Millener, P.R. 1989. 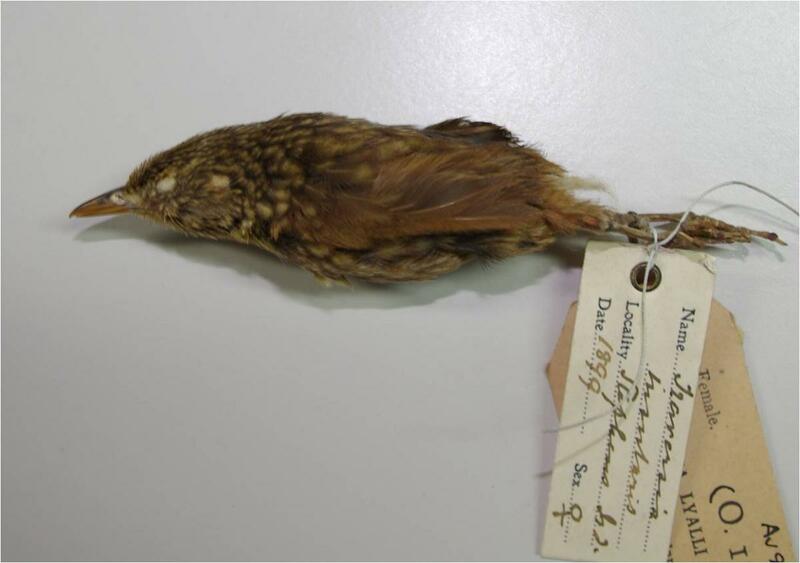 The only flightless passerine; the Stephens Island wren (Traversia lyalli: Acanthisittidae). Notornis 36: 280-284. Worthy, T.H. ; Holdaway, R.N. 2002. The lost world of the moa. Canterbury University Press, Christchurch.